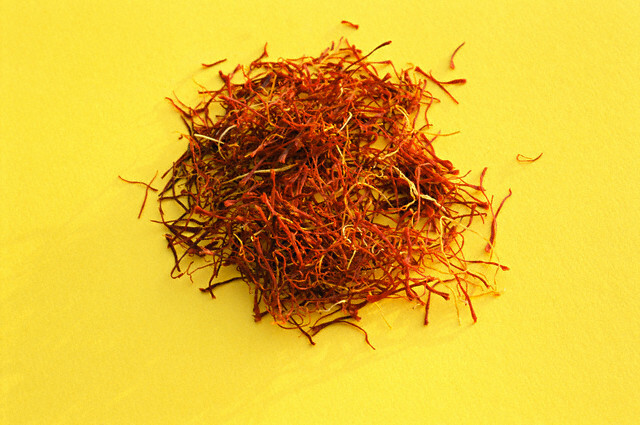 Saffron is a well-known spice used in cooking and for beauty treatment. It is expensive and has a lot of health benefits and therapeutic values. Saffron is used in many ways to get a naturally fair skin. One of the methods is to soak a few strands of saffron in milk for 2 hours and then smearing it on the face and the neck. Wait for a few minutes and then wash. If you apply this regularly, your skin become fairer. Another method is to soak saffron and sunflower seed in milk overnight and then grind it and apply on the face. Adding a few strands of saffron in your milk also helps you to get fair skin. Expectant mothers do this so that the new born child gets a glowing and fair skin. Add a few strands of saffron in 1 tsp of water and leave overnight. Next day add 1 tsp of milk, 2-3 drops of olive oil or coconut oil and a pinch of sugar to the water. Dip a piece of bread and apply on the face. Leave for 15 minutes to dry and then wash off. Ths increases blood circulation and makes your skin glow. It also helps to remove dark circles under the eyes. To get a luminous skin, add saffron to honey and massage your face with it. This will increase blood circulation and make your skin glow. Other than in cooking, saffron is also an excellent beauty product. It provides you a smooth and glowing skin. For this you have to make a face pack by mixing 1 tsp sandalwood powder, 2 to 3 strands of saffron and 2 spoons of milk. First you have to wash your face and then wipe the face. Apply the pack immediately, when your skin is still wet. Now massage your face well in circular motion, leave for 20 minutes and then wash off with water. If this is applies once in a week, you will get a glowing skin. Put a few strands of saffron in your bath water that is warm and let it soak for 20 minutes. Using this water lightens your skin. Boil half cup of water for 10 minutes and add a few strands of saffron to it and also 4 tablespoon milk powder. Apply this to your face, leave for 10 to 15 minutes and then wash with cold water. This improves the texture of your skin. Saffron is an excellent toner. For this soak saffron in rose water, scrub your face and apply it on your face. The antifungal property of saffron is made use of in the treatment of blemishes, pimples, acnes and blackheads. For this you have to make a fine paste of basil leaves and saffron and apply on the face. Wash off after 10 to 15 minutes with cold water. This will get rid of pimples and acnes from your face. A mask made of saffron with lemon helps in the treatment of dry skin. Mix saffron with licorice and milk and apply where the hair is getting thin. This increases hair growth. Saffron contains many non-volatile active components. These are carotenoid compounds like zea-xanthin, alpa and beta carotene, lycopene and so on. They are anti-oxidants and prevent the reactions of free radicals that are responsible for producing many harmful products and diseases. So saffron greatly help in prevention of diseases and harmful by-components. Saffron is a good anti depressant. The active components found in it make your body get rid of many of the anti depressant factors and make you healthy and fit. So, daily intake of saffron in small quantities is good for you. Iron is very essential for the formation of blood cells and saffron contains iron in large quantities. Hemoglobin in the blood is mainly composed of iron. People who lack hemoglobin need to take medicines containing iron. So, taking saffron regularly protects you from getting anemic. Saffron contains the mineral Potassium, which is best for the formation and repair of the cells in your body. This way you remain healthy and robust. Saffron helps in digestion and is also an anti convulsant. The plant from which you get saffron contains some essential oils, which are also volatile. These are cineole, pinene, borneol, geraniol and so on. When the plant opart is added to the food, these oils provide a special flavor to the food. Other than cell formation and repair, potassium also helps to keep your blood pressure under control and to fight against heart diseases. The components of saffron like minerals including calcium, vitamins, proteins and so on helps in maintaining the overall health of your body and to keep you healthy. Calcium is necessary for healthy bones and teeth, proteins for the growth and maintenance cells and so on. Saffron has lots of nutrients and chemicals that are essential for your health and the general well-being of your bosy. It helps in prevention of diseases and must be included when you cook food. Other than being a wonderful spice, saffron is also used for many other purposes. It is widely used in different types of therapies and spas. Therapies include body healing, detoxification etc. The various benefits of saffron make it an important constituent in the daily diet of people. By taking saffron in small quantities, you remain healthy with a glowing and smooth skin. Eating Watermelon during Pregnancy – Is it Safe?